Homemade goat cheese can be made simply by adding lemon juice or vinegar to goat milk, but using starter culture will give you more goat cheese with better flavor. Homemade goat cheese is creamy and spreadable with a tangy, milky flavor. This recipe for goat cheese was made using starter culture from Cultures for Health that contains the correct amounts of lactic bacteria and rennet. If instead, you're interested in making goat cheese from your own supply of starter culture and rennet, then the Cultures for Health website has a recipe that indicates how much of each to use. There are a couple differences between cheesecloth and butter muslin. Cheesecloth has a wider weave, so more liquid drains out, and it can only be used once. Butter muslin has a tighter weave, which is a plus when making soft, fresh cheeses like cream cheese because you'll lose less moisture and ultimately end up with more cheese. Butter muslin can also be washed and re-used. This recipe can be attempted with goat's milk, but non-dairy milk, such as soy or almond milk will not work. If your house is too cool, try culturing the milk in the oven with the oven light on. This creates a slightly warmer environment. Gently heat the milk in a stainless steel pot until it reaches 86 F then turn off the heat. Sprinkle the starter culture packet into the milk and stir a few times with the wooden spoon. Cover the pot and let the milk culture for 12-18 hours. Cultures for health recommends culturing the milk in an environment that's as close to 73 degrees as possible. The milk will not culture properly in an environment that is too cool. When the milk has properly cultured, it will have the consistency of yogurt. There will probably still be some liquid in the pot as well. This is the whey. Drape the butter muslin or cheesecloth (double layers) over a colander. Gently pour or scoop the cheese into the colander. Pull the cloth up around the cheese and tie it into a little sack. Hang the cheese up so it can drain. You can tie it to a wooden spoon or ladle and hang it over a deep bowl or pitcher. Cultures for Health recommends tying it to the handle of a cupboard and setting a bowl underneath. The cheese needs to drain for at least 6 hours, but the longer you let it drain the richer and denser the cheese will be. Twelve hours is often the right amount of time. Do not squeeze the cheese to get ​the moisture out; let it drain on its own. Scrape the cheese out of the cloth and into a bowl. Add salt if desired. 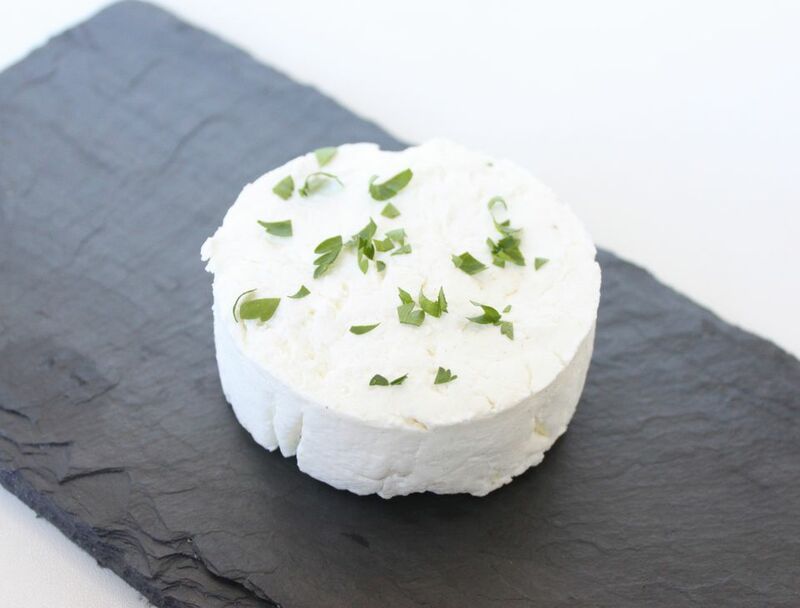 The goat cheese can also be flavored with chopped fresh herbs, dried spices or anything else you can think of. If you want to shape your goat cheese, try using a biscuit or cookie cutter with deep sides. Kept refrigerated in an airtight container the goat cheese will keep up to one week.